Conservative Republican U.S. Senate Candidate Kelli Ward joined with conservative activists across Phoenix in demanding the city council reject a petition to declare the state capital a “sanctuary city.” Letters to the mayor and each member of the ccty Council declared her opposition to such an idea and reminded them that it is their duty to uphold the law – not break it. In 2012, Dr. Ward entered politics by running for a seat in the Arizona State Senate and was unopposed for reelection in 2014. While serving in office, she continued to practice medicine in the emergency department in Lake Havasu City and Kingman. 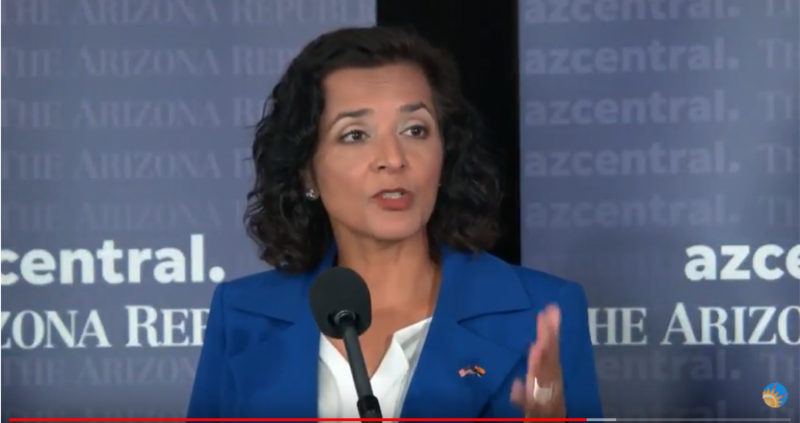 Noted as the most conservative member of the Arizona State Senate, in 2015 she announced her candidacy for the United States Senate against 34-year incumbent John McCain in the Republican primary in the 2016 election. Despite being outspent 10 to 1, Kelli Ward held McCain to his lowest historical primary total ever at 51 percent. In October, Kelli announced that she will challenge Republican Senator Jeff Flake, one of President Trump’s biggest foes, in the 2018 primary election. Sen. Flake has traditionally been weak on the border. Most amazing: President-elect Trump’s rallies in numerous states were amazing. It appeared in several states that he would lose, but then he came roaring on to take them in the latter stages of vote counting. We were appalled at some of Trump’s behavior in past years, but we are confident that with friends like Dr. Ben Carson and Franklin Graham standing with him, he is a changed man. He has the potential to undue much of the horrific damage done to the nation by Barack Hussein Obama. Most shocking: What, are you kidding? No Democratic lawsuits, no challenges over votes, no demands for recounts? When you get whipped that badly, not even Democrat lawyers can muck up the works enough to contest an election. And the Dems were no doubt over-confident that they’d win the presidency outright and would not actually need to resort to their usual dirty tricks. About the only weasel works evident were Democrat attempts to run to courts and beg judges to extend voting hours. Thank goodness, these attempts were rebuffed. Most appalling: The civil unrest that’s followed. What are high schools and colleges teaching these truant students? That when things don’t go your way, when you suffer disappointments, you walk out of school and throw a hissy fit. You need an emotional support dog. You disobey law enforcement officers by blocking streets. You riot. You damage other people’s property. You sign a petition demanding the election results be overturned. Bottom line? You do not prepare these kids for the work place. Try these stunts on work time and you’ll be out of a job. Life is full of disappointments. Grow up. Least surprising: A stand-up president would call for order, civility and calmness in the cities under siege by rioters. A leader in the White House would urge restraint and respect for the transition of power and for other people’s property. But that’s not what we have in the man in the White House. A real leader would be working with cities to quell the riots and beef up security with the National Guard. This president is weak and inept. Highly disgusting: So-called “newscasters” at ABC Channel 15 in Phoenix participated in an election commercial aimed at making a Republican congressional candidate look bad. The commercial accused Paul Babeu of mistreating students years ago as the headmaster at a school in Massachusetts. No less than four ABC “newscasters” were shown scowling during the hit piece, clearly trying to cast a pall on Babeu. Totally unethical, improper and inappropriate. Highly alarming: Radical leftist George Soros threw his big fat wallet into Arizona and took down legendary Maricopa County Sheriff Joe Arpaio. The Obama Administration had been attacking Arpaio in the courts for years. He’s an impediment to the Democrat-sponsored border invasion designed to bring in new voters. And he had to go. They finally got him. Soros is never up for election, so we can’t vote out the war chest he’s using to attack America at its foundations. Mostly gone: In two years from now we must defeat Secretary of State Michelle Reagan in the GOP primary. She has proven incompetent in her election performance, not able to master the technology, which delays voting results. The scary thing is that this pro-abortion leftist is a heartbeat away from the governor’s office, and the secretary of state’s office has been a springboard for some future governors. We can do better than this. We need a good conservative leader to take out Reagan in the 2018 primary election. Welcome newcomer: Hey, Andy Biggs, welcome to Congress! As the successor to Matt Salmon in the East Valley congressional district, we are overjoyed at your election and know you’ll do a great job! Congratulations, also, to incumbents winning re-election: Trent Franks, David Schweikert, Martha McSally and Paul Gosar. We still to regain the seat in northeastern Arizona. Abominable: We are indebted to the voters who rejected Prop 205 and stopped the national wave of marijuana legalization in Arizona. The commercials claiming marijuana would help children’s education were nothing short of abominable. Unconscionable! Unfortunately Prop 206 passed, raising the minimum wage, and that will really hurt small businesses and people seeking part-time work. The state’s new minimum wage is untenable for many businesses and they’ll hire fewer people, likely let others go. Bad move, voters. In the 13-year history of The Arizona Conservative, we have been known for our election endorsements. We’ve done the digging and the research to give you the best advice on who the best qualified candidates are. We’ve stayed up late on election nights and given the most up-to-date results we can give. Then we followed up with post-election analysis. But this year we’ve experienced adversity that made it impossible for us to provide that valuable service to the thousands of people who have come to depend on us through the years. We apologize. Some have written us asking for the usual advice on judges, but we simply have not been in a position to prepare for those questions this year. We see a light at the end of the tunnel and a brighter future ahead. We fully expect to be there for you again at election time every two years. Thank you for your understanding. We hope you will not be discouraged by what’s happening to our country and that you will stand tall and vote to the best of your knowledge before the current election season ends a week from tomorrow. Demand honest, law-abiding candidates who will lead with solid ethics and good values. Do not be swayed by those on the Left who are committed to destroy the foundations of this nation. Do not let yourself be deceived by the hollow rhetoric, the dishonest propaganda of the Left, the Democrats. Former Arizona Senator Carolyn Allen has died at the age of 78, after suffering many years from the scourge of rheumatoid arthritis. The late senator was hailed as a heroine by the left-stream flag carrier for our state, The Arizona Republic, and leftists on both sides of the political aisle. Allen was praised for her support of the arts and for warring against conservatives. Allen also deserves credit for helping Democrat Janet Napolitano defeat conservative Matt Salmon in the 2002 governor’s election. She helped suppress Republican support for Salmon in Scottsdale by criticizing him in public, and he lost by one percent of the vote. Napolitano, who spent Arizona into massive debt, over-performed among Republicans in Scottsdale and that made the difference in her election. Allen was also a friend of Big Government, amnesty and homosexual pressure groups. While she faithfully clung to her “Republican Party” affiliation, it was the GOP platform principles she distained. Amid a long absence from the legislature due to illness, The Arizona Conservative expressed concern about her constituents being disenfranchised and called on Allen to resign and devote herself to getting well. She later sent an email to our editor threatening him with physical harm. The former chairwoman of the GOP legislative district in Scottsdale exhorted Allen to train up current Secretary of State Michelle Reagan, then a state representative. But Reagan was already comfortably established in Planned Parenthood’s abortion camp. Conservatives repeatedly tried to beat Allen at election time, but the liberals in Scottsdale kept re-electing her until she retired from public office. Last night was supposed to belong to Hillary Clinton and Donald Trump. But the biggest story of the first debate wasn’t the candidates answering the questions — it was the person asking them. In one of the most talked-about plots of the first head-to-head, moderator Lester Holt seemed intent on making the debate a three-person affair — injecting himself with almost as many challenges to Trump as the person officially opposing him. For most of the night, the Republican nominee was fending off not one — but two — attackers, repeatedly put on the defensive with topics that had nothing to do with the major issues facing America. Meanwhile, the former Secretary of State, who’s probably spent as much time under investigation by Congress as she did as a Member of it, skated by virtually unscathed by Holt’s one-sided fact-checking. While he fiercely pressed Trump on his tax returns and concerns over President Obama’s birthplace, he couldn’t spare a single question on the corruption of the Clinton Foundation, her role in Benghazi, or the intentional deletion of tens of thousands of sensitive emails, or her outrageous “basket of deplorables” comment. Social media lit up with criticism for the NBC anchor, who many accused of shilling for the Clintons. Holt’s bias is difficult to argue when you consider that he interrupted Trump 41 times demanding clarification — six times the amount he interrupted Clinton (seven). He “emerged as bruised and partisan,” The Hill argued. “Holt entered the evening largely respected as non-partisan. He [exits] as the toast of left-leaning media…” Part of the problem was Holt’s lack of focus. At a time when America is dealing with terror attacks on our own soil, a military in complete disarray, and a culture melting down before our very eyes, voters deserved to hear about more important things than Trump’s tax returns. As for the actual substance of the debate, viewers were probably surprised to see a more restrained version of Donald Trump than they’re used to. Trump landed plenty of good jabs on America’s devastating trade and Iranian deals, but sidestepped some key opportunities to go on offense, especially when it came to Clinton’s email scandal — which made up a whopping 15 seconds of the hour and a half event. “I will release my tax returns — against my lawyer’s issues — when she releases her 33,000 emails that have been deleted,” he said. It was almost surreal, then, when the former Secretary of State tried to talk about the importance of cyber security — after committing one of the most dangerous breaches of it in U.S. history. “We are not going to sit idly by and permit state actors to go after our information, our private-sector information or our public-sector information,” Clinton had the audacity to declare, after risking countless lives with her own carelessness on top-secret emails. The real estate mogul’s biggest payoff came in the first 30 minutes when he assumed complete control of the economic issues, hammering back on the Left’s prosperity-is-evil doctrine. Of course, the reason liberals hate personal success is because it makes people less reliant on the government they’re desperate to grow. Wisely, Trump refused to run from his success and instead embraced it as an example of what’s possible when Americans are left (unburdened by Washington) to pursue their own ingenuity. Clinton, meanwhile, was all but drowning in her disgust of the more fortunate, alienating plenty of voters along the way with her mockery of the trickle-down economics made famous by Ronald Reagan. Like the ghost of former Democratic candidate Walter Mondale, she recycled old talking points about the ineffectiveness of the approach (which happened to produce three times as many net jobs as President Obama’s debt-funded “recovery”). Then she continued her party’s push to make government the unofficial police of income equality. That’s not only a terrible idea, but an unnecessary one, as author Arthur Brooks points out in his book Who Really Cares. Combing through piles of financial data, he found that the 30 percent of Americans who think the government should do little or nothing about economic inequality gave away, on average, four times more of their income than the 43 percent who said the government should do something. And the majority of those Americans are religious. Conservatives — the same ones who oppose this redistribution of wealth — are among the most generous people on earth. But contrary to Hillary Clinton, they call what they give to churches contributions, and what they give the government, taxes. It was one of the many profound differences in philosophy on display last night. Another was the role of the judicial system. In a largely overlooked section of the debate, the Yale Law School graduate declared that the courts had struck down the Stop-and-Frisk program because it “did not do what it needed to do.” “Stop-and-frisk,” she insisted, “was found to be unconstitutional, in part, because it was ineffective.” As Secretary Clinton well knows, however, such a simplistic characterization of the law based on the specific circumstances in one case is not accurate; the procedure is perfectly legal in many situations. Secretary Clinton owes the American voter an honest assessment of the problems she attempts to describe – as these voters are already weary of activist judges of dishonest politicians. Phoenix Mayor Greg Stanton claims progressivism is the better plan for business. That’s what he actually told the Phoenix Business Journal. It seems that ever since the last time a haboob passed through Phoenix area, the mayor’s vision and ability to reason have been severely clouded! Obviously, the mayor has not been able to see the moving trucks coming in from California and heading for Texas. They’ve left the socialist state for a state that welcomes businesses and doesn’t overburden them with excessive taxation and regulation. It is evident the mayor doesn’t know that where the minimum wage has been raised — to the lofty heights of $15 an hour in some locations — some have lost their jobs. Many small businesses cannot afford that exorbitant rate, which also means fewer part-time jobs are available. Stanton also fails to acknowledge that America’s Socialist In Chief, B.H. Obama, has threatened to put out of business those who refuse to provide abortion coverage in their health insurance plans. Through his Obama abortion mandate, the prez would rather harm the business community and the economy, putting families out of work, raising money for Planned Parenthood. He’d rather stand in the way of small businesses, religious colleges and faith-based organizations than allow the economy and the business market to thrive. That’s astounding, mayor. Progressives have long been strangling businesses in red tape, over-regulation and interference with their ability to survive. This is why we hear about American workers forced to train foreigners to take their jobs and why we lose business to other nations. Think Government Motors moving auto plants to Mexico — where Mexicans gain employment and Americans lose employment. Progressivism is socialism, which means Big Government, small citizen, small private business. Obama actually once told businesses, “Now is not the time for profits.” But that’s not surprising for a socialist progressive who prefers that government keep its all-powerful thumb on business. And that leads us right to unions. Progressives reap huge campaign contributions from unions because they are downright anti-business. Progressives are also bullish on illegal aliens — future Democratic voters and underminers of the American worker. Furthermore, progressivism has damaged our public education system for decades, eroding America’s ability to train the workers we need for an efficient business climate and economy. Foreign nationals are getting engineering and doctor’s jobs here because the schools are not preparing enough Americans for those high-paying jobs. So, bottom line, Mayor Stanton: stop dreaming and stop lying. Clear out your vision and admit the truth. Progressivism is a detriment to business. Conservatism, capitalism create the optimal business climate and represent the best interests of the American worker and the families they feed. Remember this as election time nears and as you vote. Vote smart. Vote against progressivism, which is the perfect recipe for economic and business failure. Remember also: it was progressive socialists who forced the housing market fiasco that cost many a good American his/her retirement.